The Walker-Chandling House, with its ruby shutters and sand-colored balcony, has stood, anchored in the solid rock overlooking Ellicott City’s Main Street since 1790. The oldest duplex in Howard County and nearly as old as the United States itself, the structure has served many roles through the centuries—tavern, bootery, Red Cross headquarters and, more recently, Enalee and Roland Bounds’ iconic Country Store. Today, the historic structure houses another treasure: a glimpse of Syrian culture. 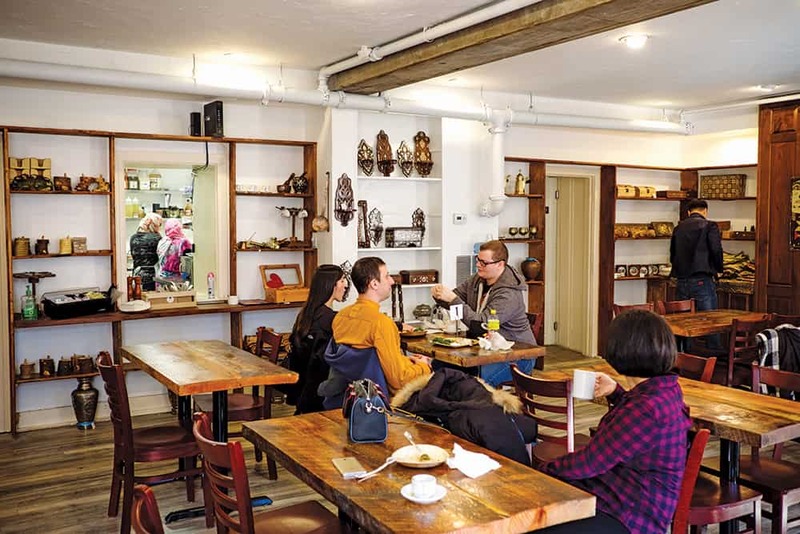 For 36-year-old Rasha Obaid, co-founder of Syriana Café & Gallery, the store offers the opportunity to share her homeland with visitors through art and food. “You can talk, eat, drink and buy things all within the same culture,” says Obaid. Customers entering the lower level are greeted by employees at the sleek café counter. A menu overhead features popular items like tabbouleh salad, shawarma sandwiches and Syrian coffee prepared in a tray of hot sand. Display cases offer glimpses of baklava; Syrian-like gelato; and savory treats like falafel, baba ganoush eggplant spread and hummus unlike any found in a chain grocery store. All items are homemade, says Obaid. 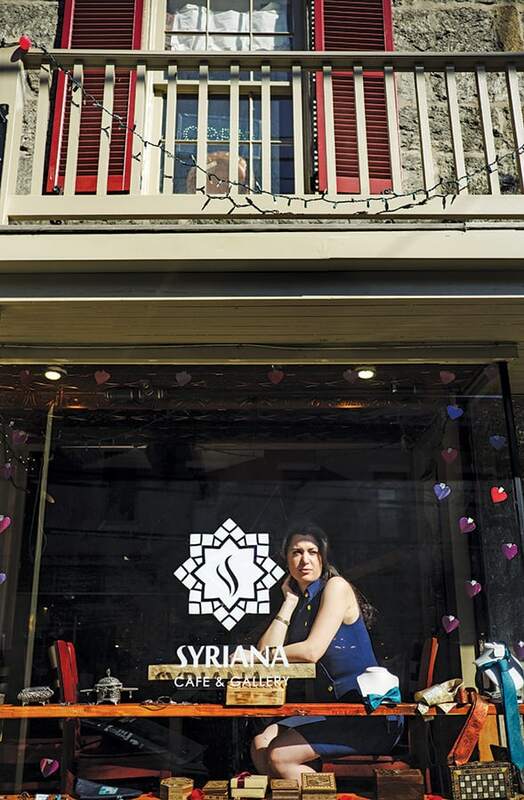 While Syriana has gained popularity and an online presence via Facebook, Foodyas and Houzz, its success is a silver lining following tragedy. Obaid´s husband Majd AlGhatrif, a Johns Hopkins physician with an appointment at the National Institutes of Health, along with his brother Khaldoun AlGhatrif opened Syriana Gallery in July, 2016. They set up shop just three weeks before the Ellicott City flood, whose destructive current washed through Main Street damaging homes, businesses and landmarks. Like many affected Main Street shops, the AlGhatrifs continued to sell merchandise at Turf Valley Resort while their brick-and-mortar location underwent renovation. ¨It took us a lot of time,” Obaid says. In addition to construction and permits for renovation, the family was also paying rent for the space. Her husband, Majd, built the tables and installed the wall décor. Brother Khaldoun and his wife,also named Rasha, worked tirelessly to prepare the space and merchandise for Syriana’s reopening. Obaid and AlGhatrif came to the U.S. from Syria in 2007, a month after they were married. They settled in Galveston, Texas, where Majd did his research in cardiovascular aging. They moved to Maryland in 2009 so Majd could begin his residency at Hopkins, Obaid says. In the meantime, she entered the nutrition program at Howard Community College. The two stumbled upon Main Street in search of coffee with some friends. They are helping by employing fellow Syrians at their new business. 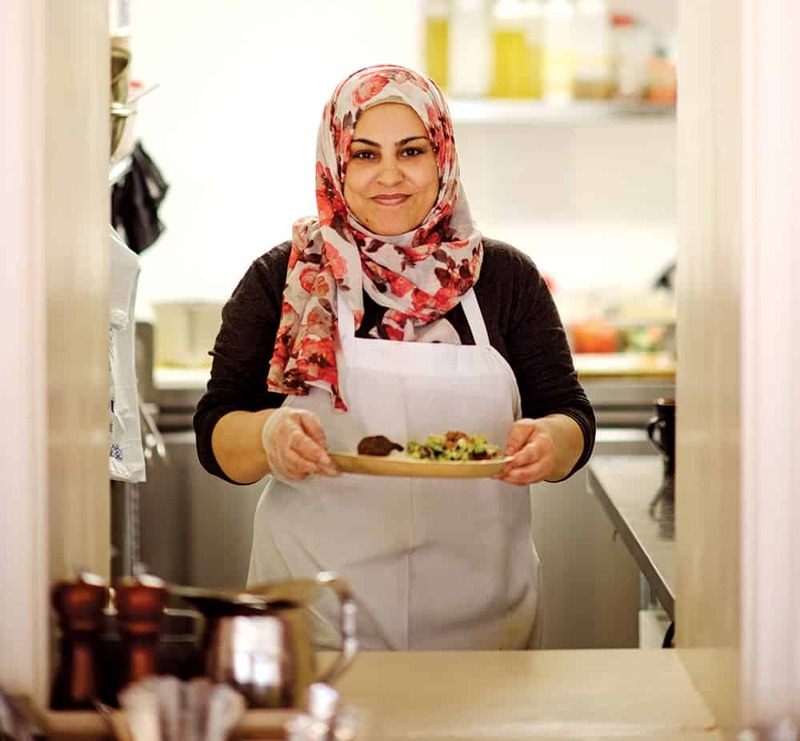 Syrian refugees helped with renovations and the restaurant’s four cooks are all Syrian refugee women, most of whom arrived in the U.S. within the last year. The cooks have made progress in adjusting to their new lives. Back in Syria, most of the women were stay-at-home mothers who had never worked outside the home before, according to Obaid. Further, as the refugee women initially functioned exclusively in Arabic, they have had to overcome communication challenges, while learning about transportation and technology in their new home. Obaid created the café’s menu based on her understanding of local tastes, she says. 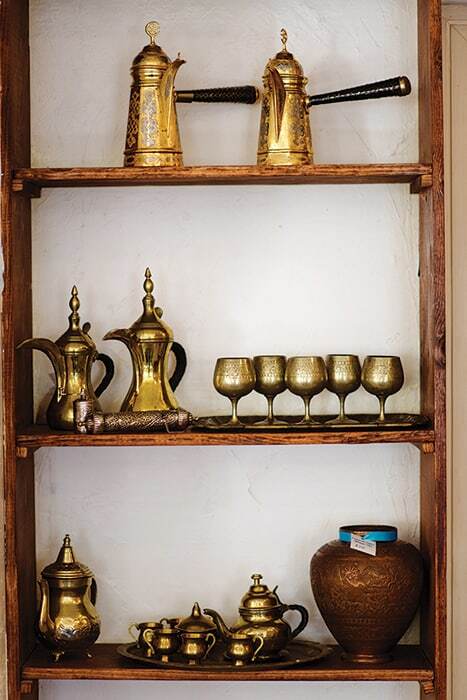 “With time, I realized what was popular with neighbors and friends.¨ She incorporated Middle Eastern dishes that people around her were already familiar with, developing many of the restaurant’s recipes in her home kitchen. On December 1, 2016, the renovated Syriana Café & Gallery reopened with several changes. The café also delivers to nearby businesses, says store manager Chris McIntyre. “They can’t necessarily leave their stores in the middle of the day to grab lunch.” McIntyre, who has a service dog, that accompanies him to work hopes to make the café similarly friendly to all pet owners. McIntyre hopes that the unique dining experience (and pet friendliness) will help Syriana stand out on Main Street. Eat-in customers can enjoy their meals on any of the store’s three levels or outdoors at bistro tables during warm weather. Each of Syriana’s floors showcases imported Syrian textiles, jewelry, purses, collector hand-carved chess sets, and carved wooden items with mother-of-pearl inlay, just to name a few. The third floor has a large open space with a rustic wooden banquet table and a projection screen where Syriana hosts community game nights and other social events. Howard County resident Tracey David¬son and her teenage daughter Hanna Al- Kowsi are regular Syriana customers. Al- Kowsi says she particularly loves the art, likening it to a museum about Syria. “The atmosphere is really perfect,” she says. Davidson, who has lived in Dubai and the United Arab Emirates, is familiar with Middle Eastern cuisine. She has lived in Howard County for 20 years, she says, “And this is the first time I’ve had an authentic Middle Eastern meal here.” She is thinking of planning a birthday party in the third floor space. When she’s not running the café, Obaid is also a nutrition student at Howard Community College. She and her husband have three young children—Rita, 6; Adam, 4; and Sammy, 2, who are excited about their mom running the café. As Rita likes to tell her younger brothers, Obaid laughs, “You can ask for ice cream as much as you want.” Even though they are not allowed unlimited treats, she says, the kids still love the idea. Syriana Café & Gallery is located at 8180 Main St., Ellicott City, MD 21043.